We went down to have a chat with the concierge about Bus tours, and he recommended Old Town Trolley Tours. There’s also a tour on an amphibious bus/boat, but that didn’t cover nearly as much. We bought our tickets from him for $26 each (he convinced us we looked like students, so got a cheaper rate!! How many students stay in $800/night suites?!?) and then headed out to a cafe for some brunch. The start of the bus tour was only 5 minutes walk from the hotel. You can get on and off of the bus at any of the 17 stops marked on the map, but we decided to just stay on as the buses were full and often couldn’t accept more people on at the stops. Our driver was a very friendly and enthusiastic “Peppermint Patty” who sang as we drove. Normally I’d find this cringeworthy, but I have to admire anyone that can do that when driving exactly the same route, every day, many times a day. 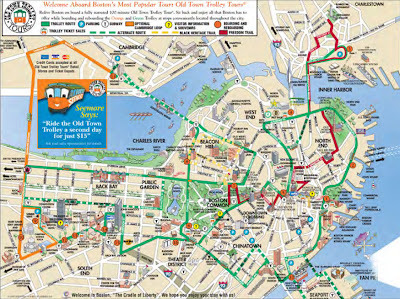 I actually really enjoyed the tour – while Boston doesn’t really have a lot of sights that you want to see from your favourite TV programmes, it does have a very interesting history, and the tour is an excellent way to learn if, like me, your history classes were the worst part of school. Boston’s TV claim to fame is Cheers… although only the front of the building. The inside is shot in a studio in LA. What we did learn on the tour though was that someone had built a Cheers bar Replica – with the inside being the same as the set, so we thought we’d go there for lunch. The show’s tag line “Where everybody knows your name” was proudly displayed over the door… when in fact, nobody knew my name there. They only knew Phil’s name because he gave his credit card for the bar tab. And Rebplica? I think not – the only thing even vaguely similar was the fact that the bar was square. The cheese fries however were very nice, and even the excitable waitress came over to me and said how much she liked them. Having looked around a couple of shops, and feeling all Bostoned out, we then headed back to the hotel to watch another film and start working again on the restocked mini bar. We were again proud to see a futher $300 dent in the mini bar bill, bringin our total to $600 – a fine effort for 2 evenings. Still adjusting to the time differences, and with an early start the next day, we crashed earlyish at about 10pm, having first checked whether our Miles & Points had posted so far on the trip.